Published: March 8, 2014 at 09:49 p.m. 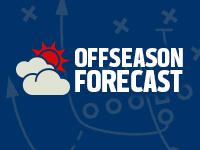 Updated: March 9, 2014 at 06:21 p.m.
On Friday's edition of the "Around The League Podcast," we predicted the Houston Texans will bypass freakishly athletic South Carolina defensive end Jadeveon Clowney to select a quarterback at No. 1 overall in the 2014 NFL Draft. General manager Rick Smith might have found a way to draft Clowney and still end up with a promising young quarterback. Citing a league source, MassLive.com's Nick Underhill reported Saturday the Texans have "real" interest in acquiring Ryan Mallett from the New England Patriots. Underhill told Around The League there is "nothing definite" yet, as it's still in the "just talking" phase. But Houston's interest is there. The Boston Herald backs up Underhill's report. The Texans have an obvious connection to Mallett. New coach Bill O'Brien was the Patriots offensive coordinator in 2011, when Mallett threw up a 108.2 passer rating on 19 attempts in his first preseason game. Sitting behind Tom Brady for three seasons, Mallett has a rifle for an arm but no notable NFL experience in games that count. Acquiring Mallett would presumably cost the Texans their early second-round draft pick. That pricetag might not make sense for other teams, but the leap of faith isn't as wide for O'Brien due to his firsthand knowledge of the player. A trade makes sense from the Patriots' point of view as well. Entering the final season of his rookie contract, Mallett will be seeking his own starting job on the open market in 2015. Bill Belichick can collect a valuable draft pick now and sign a veteran to back up Brady rather than gaining nothing in return for Mallett next offseason. We don't make a habit of going against the reliable instincts of the Houston Chronicle's John McClain, however. As plugged in as any NFL beat writer, McClain insists the Texans will not be trading for Mallett.